The sound of the tears from the elderly are particularly loud because we would expect them to be strong, having weathered through just about everything that life has thrown at them. However, humans are vulnerable beings and even sorrow is not exempted for the elderly. Thus when Syed Azmi, a man who is synonymous on social media for his social-centric status updates, posts that he saw an elderly man weeping on his own, it struck a chord among the netizens. It is hard to watch the older folks cry because we believe they would be courageous enough, at least for our sake. However, what happened to the old man is something we would all soon be able to relate to. 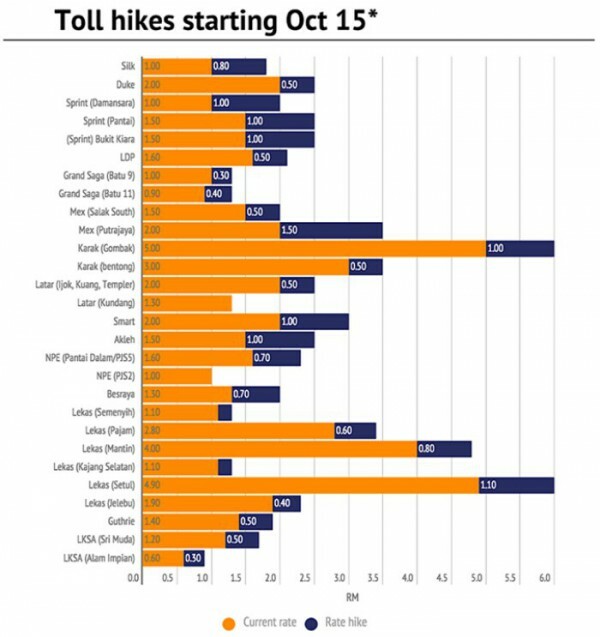 The man who was in his fifties had just been laid off from his PR job 9 months ago and the news of the toll hike impacted him greatly. This was on top of the fact that he had just returned from his first job interview since unemployment and been informed that there will be a RM0.50 increase in the route that he would take to work. It does not take a genius to put together the numbers to show that the RM0.50 will definitely add up. If this situation would befall anybody else, it would already be a painful pill to swallow, what more for a man who had spent 20 years in his previous job and is now possibly restarting a new chance at a career, only to be hit by something as unexpected as further expenditure in his daily trips to work. 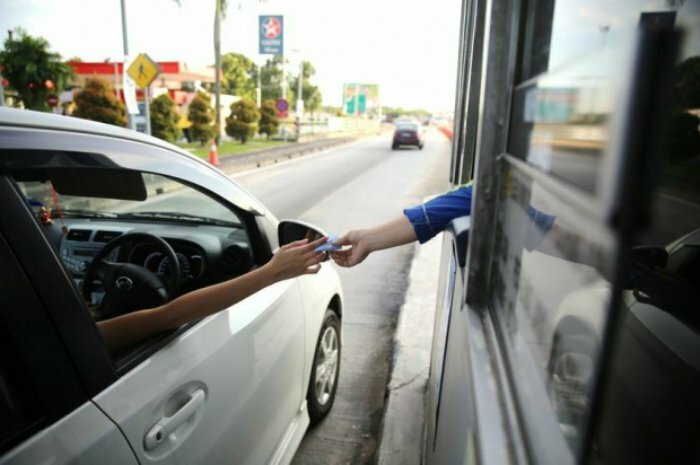 The hike in toll prices is not something that can be seen in immediate effect but an extra increment of anywhere between RM0.30 for drivers using the LKSA highway up to a whopping RM1.50 for drivers on the Mex (Putrajaya) route, will most certainly be an extra cost incurred in anybody’s monthly expenditure. The toll hike which will begin from October 15 onwards will be implemented in more than 20 highway routes and will impact most citizens who commute to and fro work. For regular folks who are just trying to make a living with a honest job, this is not easy to comprehend, as Azmi’s status update reveals. He stated the fact that the elderly man was still providing for his daughter’s university education because that was the least that he could do for her. He does not have any problems at home and his wife has started working again, but still the man needs a job in order to cope with the rising living costs. 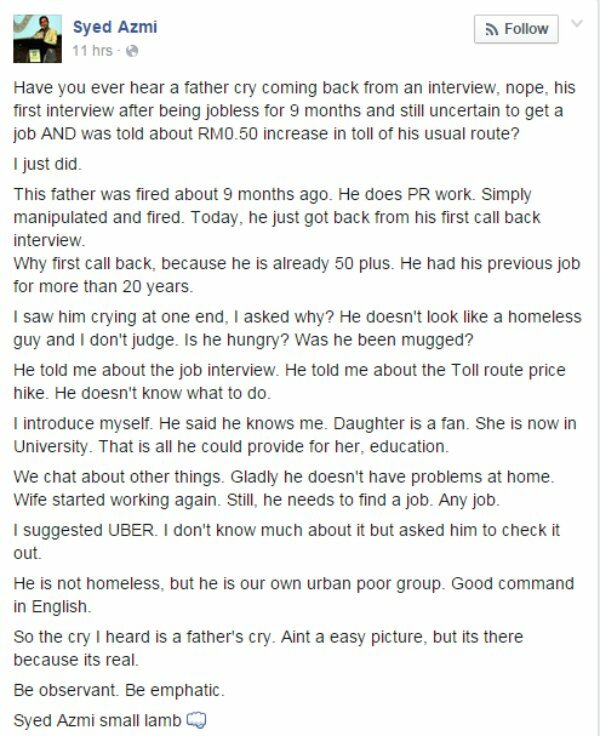 Azmi suggested that the man could take up a job with Uber and one of the netizens suggested for him to work in a café. It is great to see how social media can be a place where help is given when it is highly required. Another Facebook user also suggested that the man could take up a job as a car salesperson as people generally listen to the advice of elderly folk. This just goes to show that even when issues that hit the nation is not something that we are able to solve, there are always kindhearted citizens who are willing to offer their two cents worth of advice and go the extra mile, so to speak, in order to help make things better for another. Meanwhile, the rise of living costs is very real, and we’ll have to prepare for its effects.